This March 20, the U.S. will celebrate National Ag Day for the 45th time. Founded in 1973 as a way to increase public awareness of agriculture’s role in society, the day becomes more important every year, as consumers become increasingly removed from how their food is produced. But it’s not just awareness for how agriculture fits into people's lives that’s important. When thinking about the theme of this year’s Ag Day, Food For Life, we couldn’t help but think about the people who have built their lives around producing food. Behind the boxes, cans, and big brand names at the grocery store are millions of people and families whose livelihoods are on the farm. According to the USDA, 97% of the U.S.’s 2.1 million farms are family owned—so those items in your shopping cart are supporting not only fruit growers on the West Coast, row croppers in the Midwest, and dairy farmers on the East Coast, but also their families. 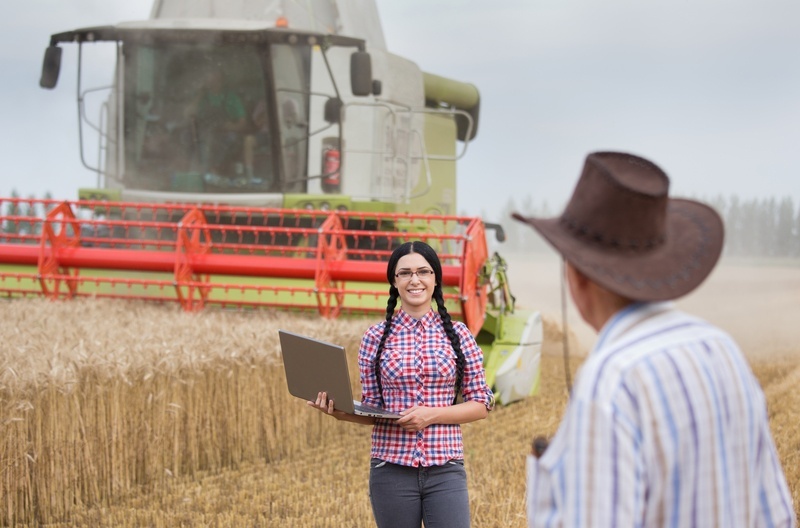 As the percentage of Americans who professionally farm has shrunk, so has the connection between consumers and the people growing their food, which is strange considering that they have more in common today than ever before. The stereotypical idea of the farmer as “Old MacDonald” needs to be put to rest. The truth is that today’s farmer is an entrepreneur who is asked to do many of the jobs—like sales, marketing, accounting, and management—that we associate with other professions. And the farmer doesn't just specialize in one of those functions. He or she does them all, every day. Farmers today also need to be as tech savvy, if not more so, than many other professions. Modern farms rely on the use of everything from drones to GPS-linked equipment, in addition to a knowledge of everything from chemistry to genetics to increase their productivity and efficiency. Another farming stereotype that no longer holds true is that of the farmer as a graying white male. People working on the farm today comprise a broad, diverse group that reflects food shoppers more and more each day. Women currently make up 30% of farm operators in the U.S., while the percentage of Spanish, Hispanic, and Latino operators (21%), as well as African American operators (12%) continue to grow. Farming is also experiencing a renaissance among young people; for only the second time in the last 100 years, the number of farmers under age 35 has grown. Further dispelling the notion of the “simple farmer,” 69% of young farmers now hold a college degree, and many of these people are coming to farming from non-agricultural families. One of the reasons most commonly cited for young people’s interest in farming is, ironically, a desire to reconnect with their food. It sounds silly among the talk of the urban/rural divide and the drifting between the food consumer and the food producer, but the similarities between the two outweigh the differences. The workforce is becoming more diverse, the jobs are becoming more advanced, and technology is playing a more critical role in all aspects of the industry. Most importantly though, at the end of the day everyone is concerned with putting food on the table for their families. And, thanks to the efforts of American farmers, the U.S. has one of the most affordable and safest food supplies in the world. Happy National Ag Day!